TM1Connect Manager is an HTML based drag-and-drop user interface that allows for easy configuration of the data to be exposed as web services for consumption by applications. The Manager is used by administrators who are knowledgeable about the TM1 system and also what data is to be delivered to the applications. To connect with TM1Connect Manager, you will need a web browser, such as Internet Explorer, Chrome, Firefox, etc. The default URL to access the TM1Connect Manager is http://<ServerName>/<Virtual Directory>/TM1Connect. This section displays the connection information, build version and links for managing the logged in user. In addition, configuration settings for the TM1Connect Server can be managed, here, such as Log File settings, session timeouts, maximum row limits, etc. This section displays the TM1 objects that can be published as web service methods that can be scheduled for export as QVX files or as web service methods to be used by the QlikView plug-in. 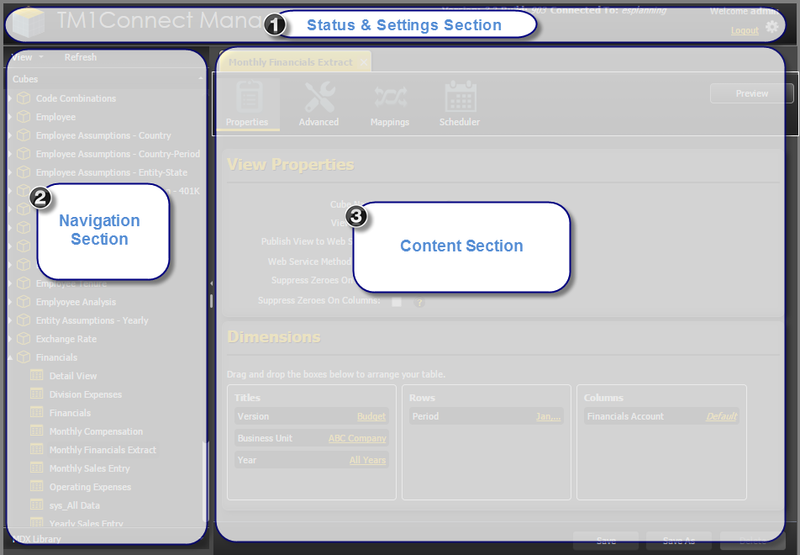 The content section is the main section of TM1Connect Manager where all the options for views can be configured for how TM1Connect constructs and manipulates views in order to meet the data requirements of the application/user they will be serving. This section provides access to all of the different configuration settings for the view being edited. Clicking on any of these items will bring up the options for that area. You may make any changes to any of the options in these areas and then preview how the data will be returned without having to save the view first. 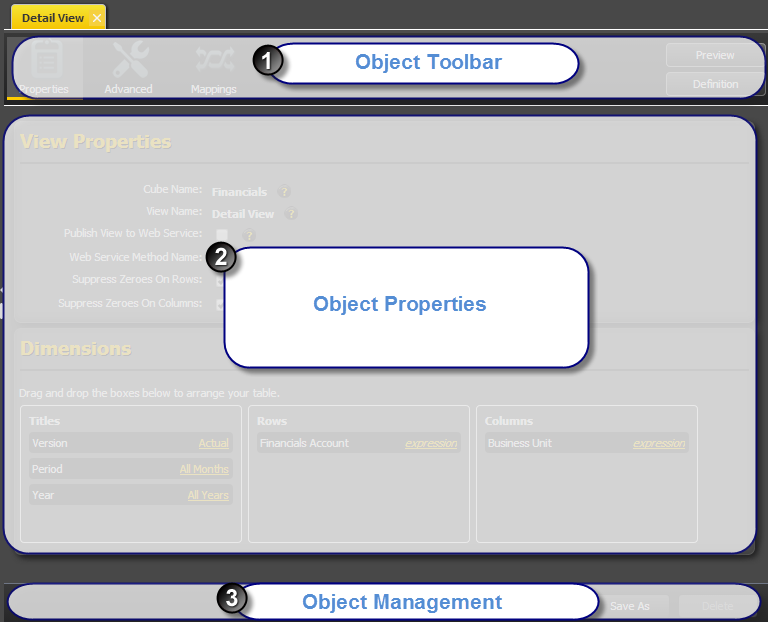 This section contains all of the properties that can be set for the view as it relates to the option selected on the toolbar. This area contains the buttons for saving, creating new, and deleting existing objects.